Tagged under Gonzo, Xebec, Series, Light Novel. In an alternative universe, where the Cold War is not over yet and the URSS still exists, an organization composed by mercenaries, Mithril, has been created to mantain world balances. Among the most talented members is Sousuke Sagara, a sixteen years old boy, who has always been involved in wars since he was a child. The boy is entrusted to protect Kaname Chidori, a girl whose brain contains valuable informations on the Black Technology. In order to fulfill his duty, Sagara enters Chidori's school, but, since he isn't accustomed to a normal student's life, he ends up causing a lot of troubles. Do we have a long history of shows like this? No, not that I know of. Even though its elements are simple in their strength, I'm also pleased to report the originality that they sport. The central commodity of the show (The Whispered) is a completely fly concept which I don't think I've seen anything quite like- and it's a fantastic chance to show off the eye candy which Gonzo is somewhat notorious for. Sure, you might complain that some of the characters are stereotypical, but I would dispute that. They're not stereotypes. If you saw one of them in a dark room, you could <i>mistake</i> them for a stereotype, but the main purpose of some of the common anime stereotypes (Excessively violent and tomboyish? Chidori?) are to be funny. And they are. I loved the neat blend of mecha action, political intrigue, and high school hijinks from the first season, TSR is another great season because it showcases KyoAni at its' best for their animation work and the plot is really top-notch. Fumoffu is okay and has its' funny moments, but it showcases too much of Kaname's "tsun" nature, whereas I felt the first and TSR gave more of a balance. I love Sousuke and Kaname as a couple, they are really good together when Kaname isn't in her "tsun" mode, the best scenes are when she and Sousuke have their tender moments together. However my favorite scene of the pair is in TSR when Kaname is giving Sousuke his haircut, great chemistry right there. Mikuni Shimokawa's songs are amazing and they're always great to listen to, Tamaru Yamada's songs for Invisible Victory were amazing too. Hopefully a fifth season will be green-lit, I was disappointed that the latest season was only 12 episodes, it deserved 24 IMO. I absolutely love this series for no real reason. I wished it had stayed as serious as the first season and second raid because those were perfect. I still enjoyed this series as a whole, nevertheless. I'm not a big fan of mechas (most of the stories I've seen are just boring for me). But this series have a nice touch that clings on to my attention. Of course, my favorite season is Fumoffu, 'cause it's the funniest and the cleverest. I always enjoy when is a series make fun of common places and cliches in the world of anime, so I had quite the treat here: with Subaki Isei, with the rugby team, with the Mikihara group... It's just common sense, right? Why all the fuzz and the waste of time if things can be actually so simple xD? The funniest anime I've ever seen! It's the story of a boy, Sosuke Sagara, trained from childhood as a soldier, who is to attend a normal school to defend a girl, Chidori, from the aims of an evil organization. Accustomed to the battlefields, Sosuke sees in every banal situation of everyday life dangers and conspiracies that don't exist, inventing extreme solutions that lead to an inevitable hilarity, very original! Sosuke is so hopelessly plagiarized as to be adorable and Chidori is the first girl I've seen in an anime with such a strong personality! SOSUKE SAGARA: "I am a model, I merge with nature becoming one with it. I think I have to disguise myself somehow." 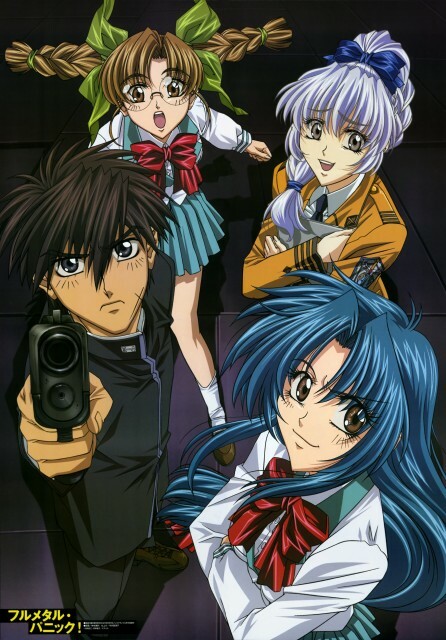 There isn't a tag for Full Metal Panic! FUMOFFU, I assume its the same thing, but I know there is a serious version of the series, and a non-serious version. I have completely seen the silly one... And let me tell you, nearly every episode had me holding my gut. Especially the one with the ponytails. Sousuke Sagara is a complete riot to have in a normal school building. Chidori and Sousuke are one of my favorites anime couples ever :P. I loved the mix between action and comedy, and I'll still watch some episodes from Full Metal Panic! : Fumoffu! when I'm down in order to laugh out loud. The Fumoffu series is hilarious XD To be honest I wasn't even paying attention in the regular series but the fumoffu was really entertaining. High school is rough, but even rougher trying to keep a military personell like Souske under control, hahahaha. I forget the rest of the peoples' names but the blonde dude is my fav of course. The eng dub was actually pretty good, I preferred it over the jap dub, which is rare. Anyways, overall funny and I guess the regular TV series was serious yet funny so I'm sure it was good too. great stuff for all 3 seasons although season 1 maybe just a bit standard and boring compared to season 2 and 3. but season 1 is logical and a complete story by its own mean. explained characters and relationships well so that season 2 stories maybe carried out in school background. season 3 arts quality is impressive in its time. the finale ending with main male clearly stating he wanted to be with the main female lead a bit of let down. The first season is good, not as good as the third one, but it catches you attention. Fumoffu!, I thinks is the name of the second season, is silly, but good. It shows us how is normal life for our main characters. Now that I remember, I laughed a lot with that one. The Second Raid is excellent. The best of the 3 seasons, there is no doubt of it. The quality is a lot better, the plot, the new danger and those new mysterious characters, I wish for a 4th season. love love love this anime!!!! For me, this is one of those cases where the dub is better! Possibly because I'm an american and they revised Sagara's lines to reflect that but, also Chris Patton does an amazing job on this one!!!!! They story is interesting it's about the high school life that becomes more complicated and dangerous by the minute . It's about the pure love between a high school girl and a highly trained soldier that knows nothing about love and have difficulties while he's trying to adapt to a normal life .